KAPLEBYONG – The newly created district of Kapelebyong is bound to lose Shs1.2B that was allocated to it, says Nasser Mukiibi the Chief Accounting Officer. Mukiibi made the revelation during a community ‘baraza’ and leadership debate that was organised by Foundation for Human Rights Initiative (FHI) while implementing a project titled “Promoting Active Citizenship in Uganda” whose main objective is to raise citizens’ consciousness and awareness on civil rights and electoral processes Kapelebyong. He said that the interim council has failed to recommend a commission of a neighbouring district to undertake the recruitment of staff on grounds that they are waiting for elections to be conducted. “In this case, I see the district losing a lot of money that is meant to be for Wages for staff,” said Mukiibi adding that “if the recruitment is not undertaken at the end of the financial year, about Shs1.2B will be returned to the treasury. Hon Richard Enyangu, one of the district councillors, has however defied CAO’s diffractive saying arguing that the community is not interested in borrowing the commission of another district at the moment. “We are advocating for government to conduct elections in Kapelebyong so we are able to put a substantive commission that will do the services because there are so many issues that are associated with borrowing a service commission”, Enyangu said. During the launch of the 2021 roadmap, the Electoral Commission (EC) Chairperson Justice Simon Byabakama told the press that there were no funds to conduct elections in the six new districts. But locals in some of these districts including Kapelebyong still have hope that it is not too late. “We are waiting for a write up from the Electoral Commission declaring that they have failed to conduct the elections in the six new districts. It is then that we shall write to the Ministry of Local Government to put an interim Service Commission not borrowing. We can’t allow borrowing and in the end, we lose everything both the money and the jobs, he added. The demand for elections is still high as citizens believe it is the only solution to the many challenges in the district. 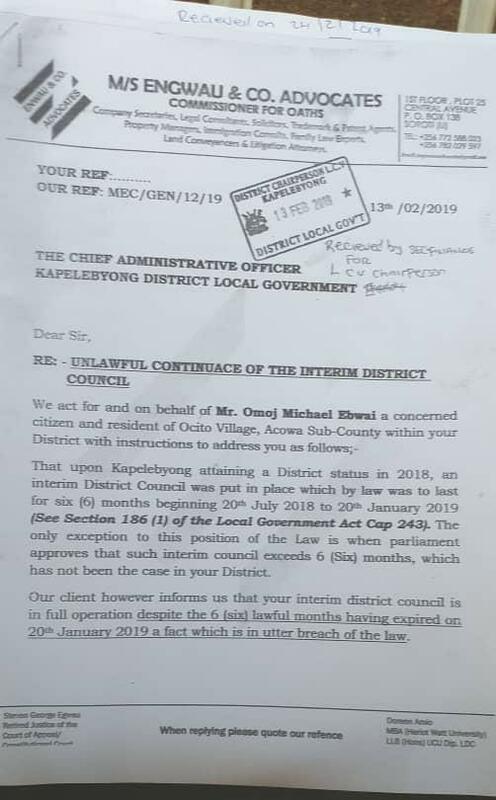 In a letter dated February 13, 2019, Mukiibi was sued by a resident identified as Omoj Michael Ebwai for the unlawful continuance of the interim council. “… this communique, therefore, serves to demand that you immediately denounce the illegal district council and stop facilitating its activities ..” read a section of the letter. In his defence, Mukiibi argues that the letter is addressed to the wrong person. “I cannot terminate the interim council because I have not received any official communication from the powers above until then, the council is still operating”, Mukiibi said. “It is not me, who organises the elections, that letter should be addressed to the Electoral Commission and the Attorney general”, he added. 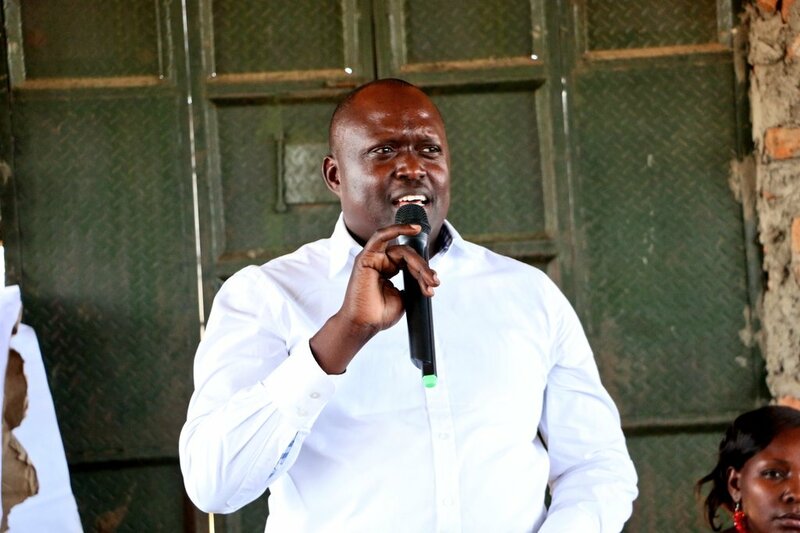 Over ten LC 5 aspirants while meeting their electorates during the community baraza, pledged to develop the district and solve the issues affecting the district once elected into power.